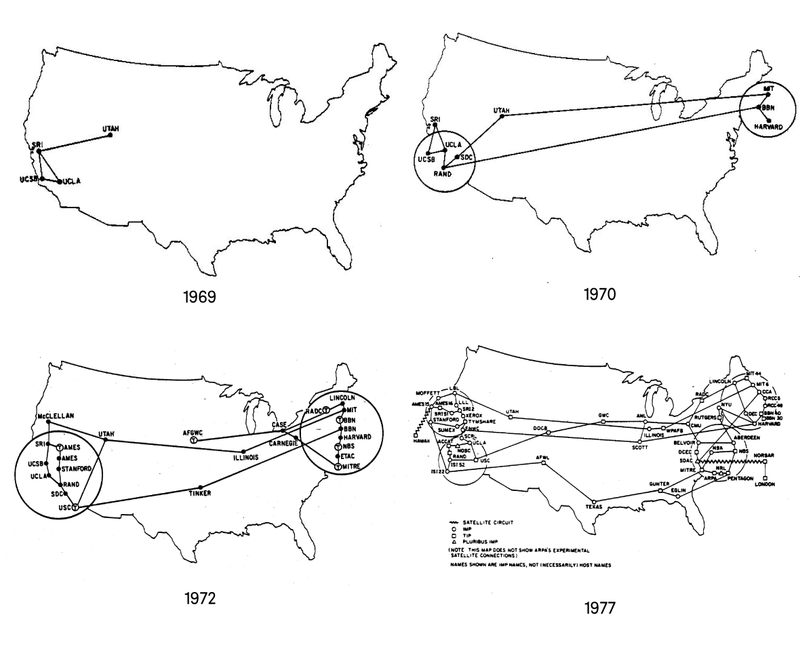 Maps of Arpanet from December 1969 to March 1977. During the Cold War, the United States worried about an attack on its communication networks, mainly phone lines, which were exposed and vulnerable. To address those concerns, the Department of Defense and the Massachusetts Institute of Technology (MIT) began to develop a closed computer network called Arpanet, decentralized and safe from attack. But as the network expanded, to more places with more users, it became more difficult to maintain security. J.C.R. 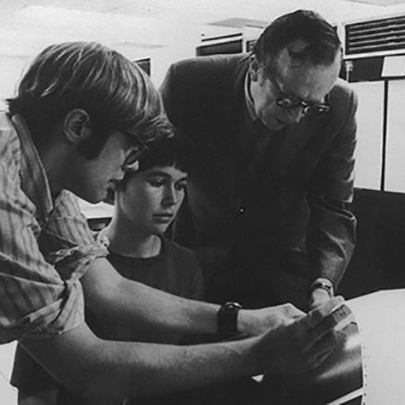 Licklider of the Defense Advanced Research Projects Agency (DARPA) and MIT first described what would become Arpanet, and eventually the internet, as an Intergalactic Computer Network. In a series of memos, Licklider conceived of a “globally interconnected set of computers through which everyone could quickly access data and programs from any site.” These memos were, in part, a response to American scientists’ fears of a Soviet attack on the nation’s telephone system. 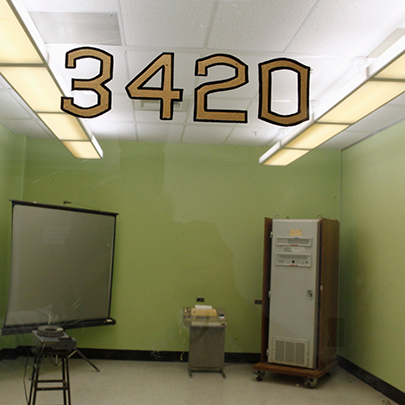 UCLA's Interface Message Processor (IMP), right, is pictured in the birthplace of the Internet, at 3420 Boelter Hall, the original location of the first Arpanet node at UCLA in Los Angeles, California, on June 2, 2011. 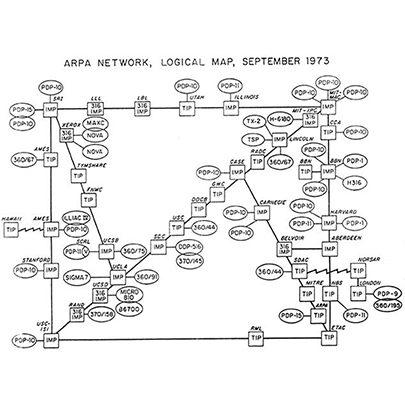 Thanks in large part to research by Thomas Merrill and Lawrence Roberts, who created the first computer network using telephone lines, Arpanet came online and delivered its first message from a computer at the University of California, Los Angeles, to another at the Stanford Research Institute. The system crashed after only the first two letters of the message, “login,” had been transmitted. By the end of the year, four computers were connected to Arpanet. 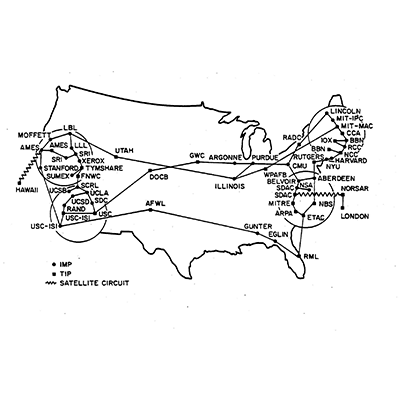 A map of Arpanet from September 1973. The connections to NORSAR and London can be seen in the lower right corner. Arpanet made its first international connection across the Atlantic Ocean when University College London and Norway’s Royal Radar Establishment joined. As these computer networks grew together, so did the challenge of integrating them into a single, worldwide internet. At this point, Arpanet still remained a secretive Defense Department project, virtually unknown to the public. 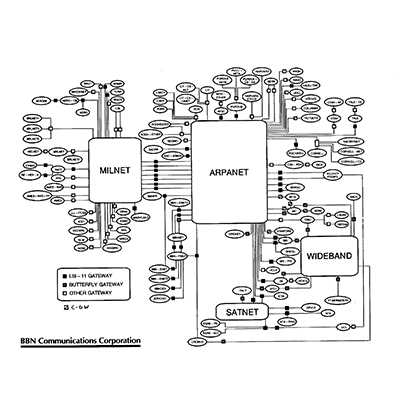 A map of Arpanet from July 1975. The Defense Department’s Defense Communication Agency took over control of Arpanet, which had reached fifty-seven network computers and was growing. As the network grew, it became increasingly difficult to figure out who was actually using it and who was doing what, and the U.S. government’s initial security concerns resurfaced. 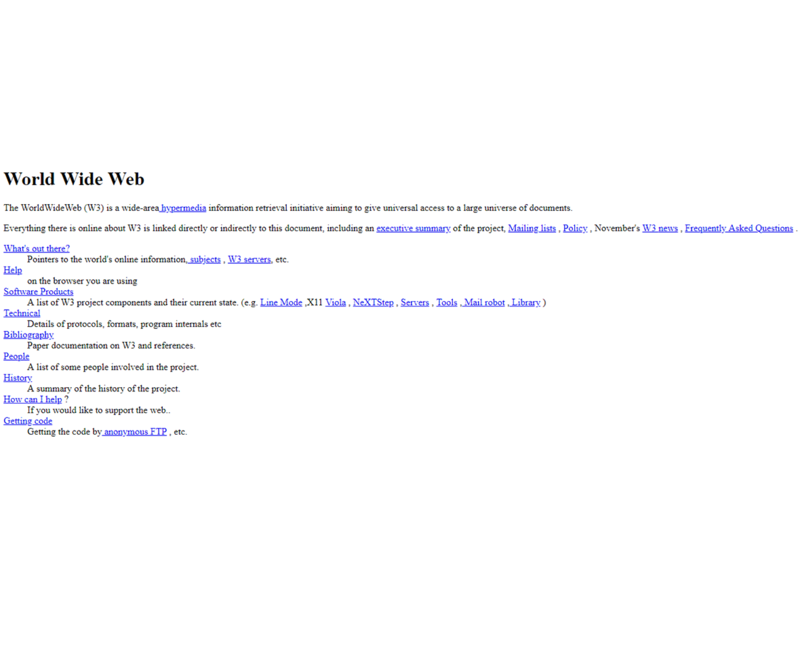 A screenshot of the first page on the World Wide Web. As the network grew, the Department of Defense began to find it difficult to know who even was using the network; this gave rise to serious concerns over security. Therefore, in the early 1980s, researchers and the private sector took over much of the development and expansion of the Arpanet, which then be-came the internet. During this period of innovation, developers and inventors typically turned over their technology to the public domain. A map of the entire Internet from around 1985 or 1986. The Defense Department closed off its computers from the Arpanet, citing the need for heightened security due to the “sensitive nature of military systems and the increasing sophistication of civilian computer experts and illegal system trespassers, often called ‘hackers.’” This resulted in the formation of the department’s own military network. A community of network designers, operators, vendors, and researchers came together in San Diego, California, for the first Internet Engineering Task Force (IETF) to establish and guide internet architecture and standards. 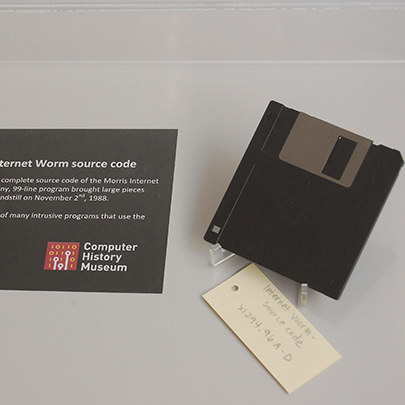 The Morris Worm source code on a floppy disk on display at the Computer History Museum in Mountain View, California. Robert Tappan Morris unleashed the first malicious internet-based attack known as the Morris worm, in what he described as an attempt to see how many computers were hooked up to the nascent network. Six thousand internet-connected computers—about 10 percent of all network users at the time—were affected. The Morris worm sparked an irreversible conversation on cybersecurity; Morris was one of the first people convicted under an anti-hacking statute and received a three-year probation, 400 hours of community service, and a $10,050 fine. The first commercial for a major internet service provider. One year after CompuServe released the first commercial dial-up service provider, Arpanet was decommissioned. Taking a step toward a worldwide internet, the military handed over administration to the National Science Foundation Network (NSFNET) to promote development of this research and higher education network. 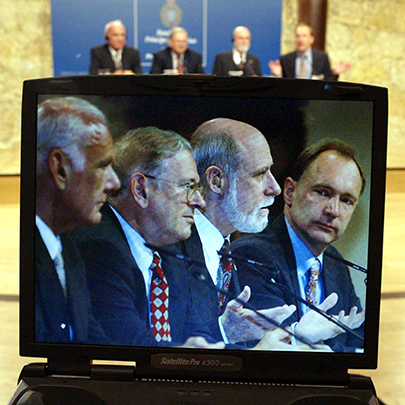 British researcher Tim Berners-Lee (far right) and American researchers Robert Kahn (far left), Lawrence Roberts (second from left), and Vinton Cerfy (second from right) are shown in a laptop's screen during a joint news conference in Oviedo, Spain, on October 24, 2002. An English computer programmer named Tim Berners-Lee, at the European Organization for Nuclear Research (CERN), introduced the World Wide Web, which allowed the internet to be a web of information rather than simply a network to send and receive files. To achieve this, he developed the technology behind hypertext markup language (HTML), uniform resource identifier/universal resource locator (URI or URL), and hypertext transfer protocol (HTTP), all of which exist in the current internet structure today. Berners-Lee turned over the technology to the public domain in 1993. 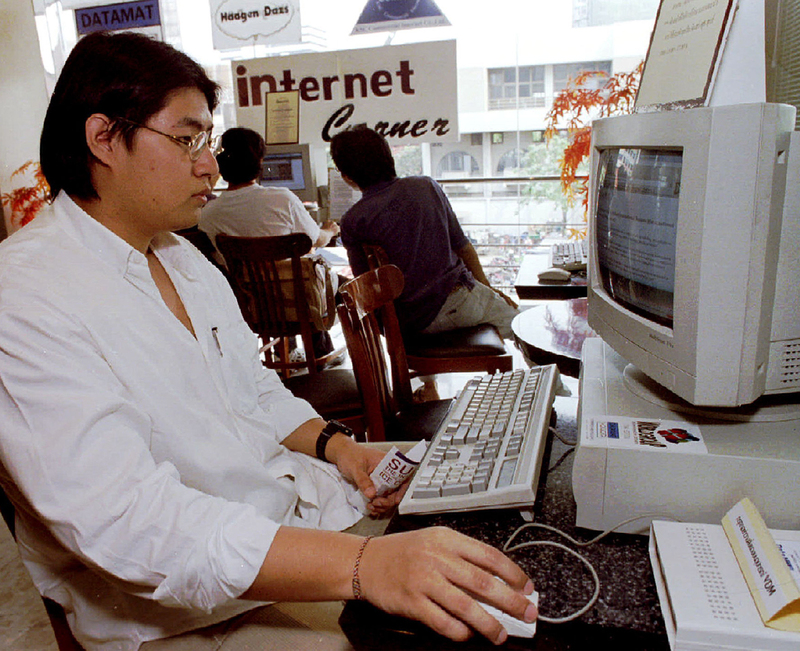 A Thai university student surfs the internet at an ice cream shop in Bangkok on February 8, 1996. After the introduction of the World Wide Web by Tim Berners-Lee, the internet was ready for world-wide civilian consumption, and the U.S. government further privatized its management to keep up with demand. But lack of regulation gave rise to internet service provider (ISP) monopolies, a legacy that consumers in the United States deal with today. 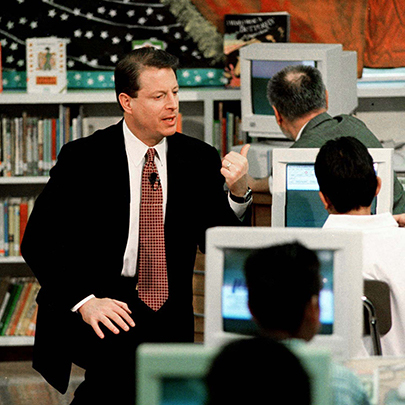 Vice President Al Gore discusses the Internet with a student of Pacoima Elementary School on January 31, 1998. Introduced by then Senator Al Gore (D-TN), the High Performance Computing Act (HPCA) was passed by Congress in December. The bill allocated $600 million for high-performance computing, created the National Research and Educational Network, and led to the creation of breakthrough internet technologies such as high-speed fiber optic computer networks. A screenshot of the Mosaic 1.0.3 web browser. 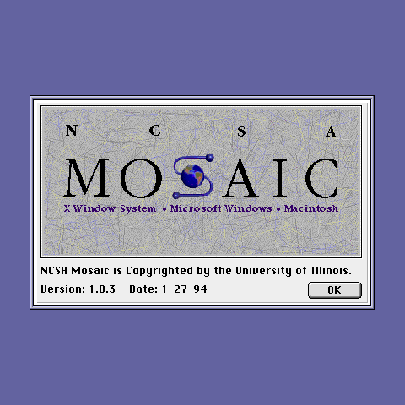 Funded in part by the HPCA, researchers at the University of Illinois developed the first user-friendly web browser called Mosaic (renamed Netscape), which allowed the user to view words and pictures on the same page, with scroll bars and clickable links. Before the invention of this browser, any multimedia would appear in a new window. This year, the number of computers connected to the internet surpassed one million. 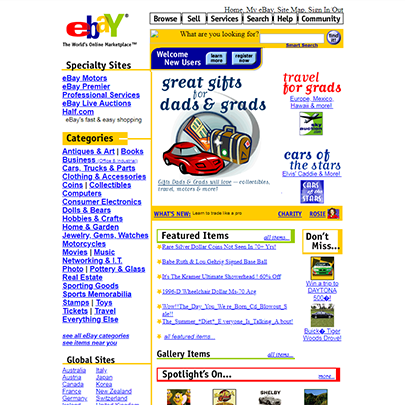 A screenshot of the eBay homepage from June 8, 2001. When it became clear that the internet had much more use beyond the sharing of research, NSFNET was dissolved, resulting in an effectively privatized internet. At this point, the Bill Clinton administration turned over management of the internet’s growing backbone to the private sector. Commercialization of the internet also began in earnest, as Secure Sockets Layer (SSL) enabled online financial transactions. In September, eBay was founded. President Bill Clinton delivers remarks at the signing of the Telecommunications Act of 1996. Congress passed the Telecommunications Act, which led to significant deregulation of internet service providers (ISPs). This legacy has led in part to ISP monopolies in certain areas of the United States. In 2017, an estimated 129 million Americans had only one company to subscribe to for broadband internet service. 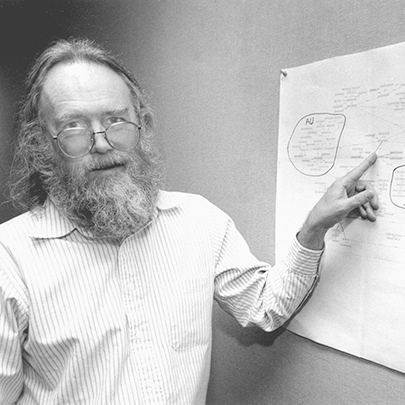 Jon Postel, director of the Internet Assigned Numbers Authority, with a hand-drawn map of Internet top-level domains in 1994. Postel submitted the proposal for the Internet Corporation for Assigned Names and Numbers (ICANN) just prior to his death in 1998. To keep up with the growing number of internet addresses on different domains such as .com, .net, and .org, due to the dot-com boom, the U.S. government privatized the domain name system (DNS). A non-profit organization called the Internet Corporation for Assigned Names and Numbers (ICANN) was formed to take over the responsibility to “administer policy for the Internet name and address system” from the University of Southern California’s Internet Assigned Numbers Authority. Along with other developments, the formation of ICANN marked an important transition from the internet’s military and higher education origins.